We believe that Bread on long term has huge potential. 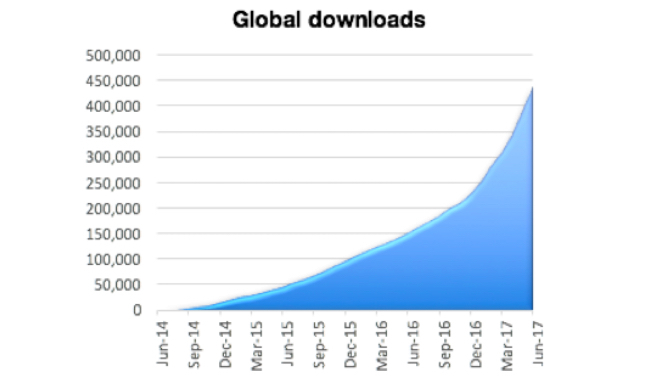 The fact that they already have a working product with over 700.000 downloads shows that they know how to build a successful product. Bread aims to be the largest, decentralized financial institution in the world – all without holding customer funds or personal data. In the same way that Uber is the largest transportation company that owns no vehicles and Airbnb is the largest hotel company that owns no buildings, Bread wants to become the largest financial institution that controls no customer funds. Bread envisions a future in which money is as fluid as information on the internet. Consumers are in control of their own finances, and rely on no one but themselves to keep their money safe. No longer do the livelihoods of millions of people rely on banks being able to manage their assets properly, weathering the risk of embezzlement and greedy investment practices. Anything that currently can be done through a bank, credit card issuer, or payment processor will soon be doable with cryptocurrency, all on the user’s own device. With a basic smartphone, the average consumer will be able to receive their salary, pay their bills, take out a loan, invest in stocks and savings accounts, send money around the world, and make purchases online. What problems does Bread aim to solve? Bitcoin​ and other cryptocurrencies​ are not easy to use, and​ uninviting​ to new users. There are limited​ places​ to​ use​ your​ digital assets,​ and​ no​ option to​ centrally manage​ ​ them. Most banks do not​ offer any​ of​ these​ options today,​ and​ are​ often​ set​ up​ nationally,​ ​ not​ globally. What product does Bread offer? Today, Bread is already well known as a wallet for storing, sending, and receiving bitcoin. It connects directly to the bitcoin network, meaning it is completely decentralized and doesn’t rely on their servers to function. It also features a completed framework for accessing decentralized, third-party financial services. Users who choose to use these services enter the personal information that is required by each service, and that data is stored, encrypted, on the user’s own device. Ethereum support: this new wallet functionality will work similarly to how their current bitcoin wallet operates, and will allow users to interact directly with the Ethereum network, while keeping their private keys under their own control. Portfolio management: they will be introducing a robust portfolio management platform, with a design similar to asset trading and management platforms for the traditional financial industry. As a premium service, users may also be able to access information on ICO presales, or even participate in presales as soon as they are announced. Additional buy and sell services: They aim to offer the ability to buy and sell tradditional bank services of assets in as many jurisdictions as possible, by partnering with existing cryptocurrency and token exchanges which are each compliant with their geography’s laws and regulations. For example, if you open your Bread in Japan, you will be given access to local exchanges and services that are legally compliant and serve customers in Japan. If you then travel to Germany and open your Bread there, you will see the services that are available for use in that region. Decentralized asset exchange: They will be deploying the functionality which will make it possible to trade various assets with other users of the Bread platform, atomically and without requiring either party to know or trust the other. Additional financial services: They plan to offer all the services a normal bank would offer, but in a decentralized way. Some of these features include direct deposit of salary in the form of cryptocurrency sent straight into the user’s wallet, peer-to-peer lending, automated bill pay, and long-term savings accounts. 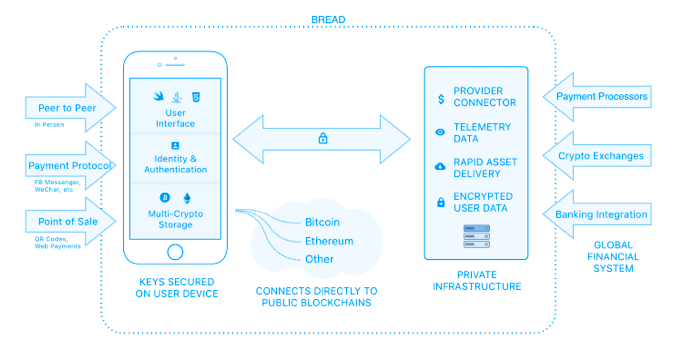 Open payments platform: Bread will be developing an open platform for making user information available outside the Bread ecosystem in a controlled way. Users will be able to securely provide their information to merchants or services they interact with, either in person or online, and merchants or services will be able to access the APIs required to request this information from their users. Adam is co-founder and CEO of Bread. Previously, Adam was CEO of WearSens, a wearables startup focused on monitoring eating habits. He has held a variety of sales, marketing, management and engineering positions throughout his nearly two decades in the hardware, software and Internet industries. Adam began his career at the NASA Jet Propulsion Laboratory and Caltech in the fields of hardware and software engineering. Aaron is co-founder and President of Bread. Previously, Aaron led mobile app development at Yammer and Banjo. Aaron was co-founder of Lightt, a popular social video sharing app, which was sold in 2014. Throughout his career, Aaron has held a variety of software development positions at prominent Silicon Valley mobile app and web startups. He has a strong focus on consumer applications designed with the utmost care for simple and intuitive user experiences. James started with bitcoin in 2012 while living in Japan. He was at the center of the Japanese bitcoin industry as an organizer for the Tokyo Bitcoin Meetup, and soon became a cryptocurrency expert. After moving to San Francisco, James worked at Coinbase, Kraken, and now Bread. He runs the development roadmap and execution as Bread’s head of product. Sam is now bringing access to censorship-resistant, privacy-respecting currency to the world as the CTO of Bread. How are Bread (BRD) token used? Bread is introducing the Bread token (BRD), which will give users access to special perks within the Bread platform. The token does not offer any monetary benefits associated with securities. The token is used within the app and decentralized banking platform and is not tied to equity, virtual equity, or performance of the company. Users will be able to earn Bread tokens through various promotions and giveaways. These promotions will be designed to also benefit Bread from a marketing perspective. Rewards and bonusses: Answering opt-in surveys through the app. The results of these surveys will give valuable insight into the wants and needs of frequent cryptocurrency users and Bread customers. Social media giveaways which rewards users who make the most entertaining, interesting, or compelling public posts about the benefits of using the Bread platform. These posts will increase Bread’s exposure and attract new users. Airdrops: Automatic airdrops to users who are frequently active or hold a certain amount of currencies or tokens in their wallets. This will encourage users to choose Bread over competitors. In-app discounts and special pricing: Discounts on in app purchases, for example, third party services offered through the Bread app require the user to pay a service fee in order to access their services, if you use the Bread (BRD) token, you will be given special discounts. Nearly all of these services will have two different price levels: the regular price, if paid for in bitcoin, Ethereum, or other currency, and a special discounted price if the user decides to pay for the fees using BRD tokens. Complimentary acces: If a user holds a certain amount of Bread tokens in their wallet, certain subscription models will be provided free of charge. Exclusive access: Other features, such as early access to token crowd sales, early access to new features, special in-app content, or other perks, will only be available for purchase with BRD tokens, or will only be accessible to users who hold a specific amount of BRD tokens in their Bread wallets, depending on the feature. Exclusive features might also include perks outside of the app, including direct lines of communication to the executive team, input on features that make it into the upcoming development roadmap, and networking events reserved for users who hold a large amount of tokens. Non – Custodial: Companies like Coinbase are highly regulated because they are custodial – like an old fashioned bank. Bread is unregulated because they are a non custodial bank. The inverse of a normal bank. Think AirBNB.. the largest hotel in the world but owns no rooms. Bread wants to build the world’s largest decentralized bank but will hold non of the customer’s funds. Companies like Coinbase spend millions to become legally compliant as they slowly move from one geography / country to another. Bread, being legally unregulated, has no such issue. They can use all their money to engineer new features, integrate with financial services partners across the globe and most importantly – to expand internationally and acquire users while it’s cost effective and before the competition who is slow to expand because of their custodial model. Reputation: They have a good reputation in the cryptoworld due to their active involvement in the development and enhancement of the Bitcoin Protocol. User has a single point of failure: All customer information is stored on the users device, when the user breaks or loses the device – and did not take the appropiate backup measures – they risk to lose access to all their funds, as bread does not store any personal user data. Dependency on partners: Their strong selling point can also be a weak point.. their dependency on partners for their services, if there are disputes, who is liable for what? – what if the service provider decides to give their own customers faster access, better benefits? Etc. Regulatory: Laws are not yet fully on track with blockchain technology, there is a risk that bread needs to make substantial modifications to their services. We believe that Bread on long term has huge potential. The fact that they already have a working product with over 700.000 downloads shows that they know how to build a successful product. Their Uber and AirBnB style of operating has shown to be a success in their respective fields, so why would it not work in the financial sector? Never before has non-custodial banking been possible, but with the power of bitcoin and the blockchain, it now is. Since Bread doesn’t hold customer funds, they can legally operate around the world without needing to comply with local laws around custodial banking. This means a simple, frictionless onboarding process when a new user downloads Bread. No registration required; within seconds, you have a decentralized bank account. And that is exactly how finance should be. We wanted to invest in this ICO, but during the ICO they made some major mistakes with their wallet. The crowdsale got postponed and we decided not to invest. Because as an wallet provider, you an not make this kind of mistakes.